Can you guess? | Primary Planet! Every year at this time we work on Descriptive Writing. One of the first activities that we do is to describe a food. Each teacher on the second grade team (there are four of us) chooses a food to describe. Writing lessons are always more fun when you get to eat! :) Then, as a class we enjoy our snack while thinking of describing words for our treat. Once we are finished eating, we get together to write a description. 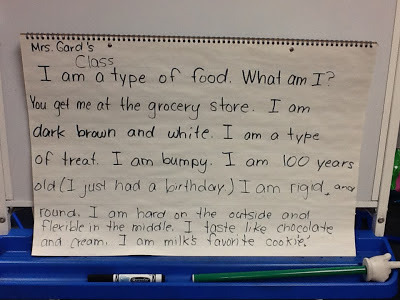 Can you guess what our class wrote about? When we are all finished with our descriptions we trade our descriptions and we try to figure out what kind of food each class ate. In my room I slowly read the description and when the kiddos think that they know what it is, they put up their thumbs. We decided that if it is a good description we should be able to figure it out easily. We also talked about what key words helped us to figure out the descriptions. We picked out which senses they appealed to. It is a fun activity that the kiddos really get into (I am sure getting to eat has nothing to do with it)!